The Essex was a brand of automobile produced by the Essex Motor Company between 1918 and 1922 and by Hudson Motor Company of Detroit, Michigan between 1922 and 1933. During its production run, the Essex was considered a small car and was affordably priced. The Essex is generally credited with starting a trend away from open touring cars design toward enclosed passenger compartments. Originally, the Essex was to be a product of the "Essex Motor Company," which actually was a wholly owned entity of Hudson's. Essex Motors went so far as to lease the Studebaker auto factory in Detroit for production of the car. By 1922 the Essex Motor Company was dissolved and the Essex officially became what it was all along, a product of Hudson. Essex cars were designed to be moderately priced cars which would be affordable to the average family. Proving durable, their capabilities were checked upon and confirmed by AAA and the United States Postal Service. In 1919 an Essex completed a 50-hour, 3,037.4 miles (4,888.2 km) endurance test in Cincinnati, Ohio, at an average speed of 60.75 miles per hour. The early Essex cars also captured many hill climb records. In a special Essex race car, Glen Shultz won the 1923 Pikes Peak Hill Climb. It had a 108.5-inch (2,760 mm) wheelbase. Initially Essex marketed a line of touring cars (open four-door cars with canvas tops), which was the most popular body style of cars in production at the time. While Essex added an enclosed sedan in 1920, it was the introduction of the 1922 closed coach, priced at $1,495 (which in early 2015 would be between $15,917 and $21,015, depending on the inflation calculator used), $300 above that of the touring car. 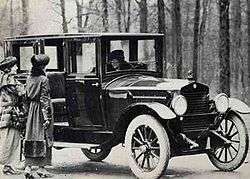 By 1925 the coach was priced below that of the touring car. While Henry Ford is credited with inventing the affordable car, it was Essex that made the enclosed car affordable. By 1929, the Essex was third in U.S. sales, behind Ford and Chevrolet. Essex sales remained strong into 1931 before sales began to trend downward. For 1932 a redesigned Essex debuted and was named the Essex-Terraplane, a play on the word aeroplane. For 1934 the Essex name was no more and the car carried on as the Terraplane. The instrument panel of the 1932 Hudson and Essex automobiles featured the first use of "warning lights" instead of gauges. ↑ Lamm, Michael; Holls, Dave (1996). A century of automotive style: 100 years of American car design. Lamm-Morada. p. 29. ISBN 9780932128072. Retrieved 30 June 2012. 1 2 3 Kimes, Beverly (1996). Standard Catalog of American Cars 1805-1942. Krause Publications. ISBN 0-87341-428-4. ↑ "Essex cars article". Remarkablecars.com. Retrieved 2012-05-31. ↑ Swift, Earl (2011). The Big Roads: The Untold Story of the Engineers, Visionaries, and Trailblazers Who Created the American Superhighways. Houghton Mifflin Harcourt. p. 88. ISBN 9780618812417. Retrieved 30 June 2012. 1 2 3 4 "1926 Essex Instruction Book". Oldcarbrochures.com. Retrieved 2012-05-31. ↑ 1926 Hudson & Essex mechanical specifications & adjustments (PDF). hudsonterraplane.com. Retrieved 2012-07-01. ↑ "1922 Affordable Closed Cars". Popular Mechanics. 173 (5): 50. May 1996. Retrieved 30 June 2012. Wikimedia Commons has media related to Essex vehicles.